With August here in full swing, I can't help but crave fall. I am more of a "chilly morning, crisp air, hot latte, oversized sweater, cozy booties" kind of gal. I tried really hard to love this summer weather although I found myself caught up with work/weddings. The past couple of days I have been scouring the internet to try and get a head start on my fall "back to work" shopping (more on this in a later post). I have to admit, I'm very disappointed. Usually brands have their fall lines out in stores right now but all I see are tank tops and shorts. #didimisssomething What I have found however, are great transitional pieces. We can't simply start wearing chunky fall sweaters and boots right off the bat (although I'd love to), I plan to ease into fall effortlessly with these pieces. You can never go wrong with fall staple pieces. 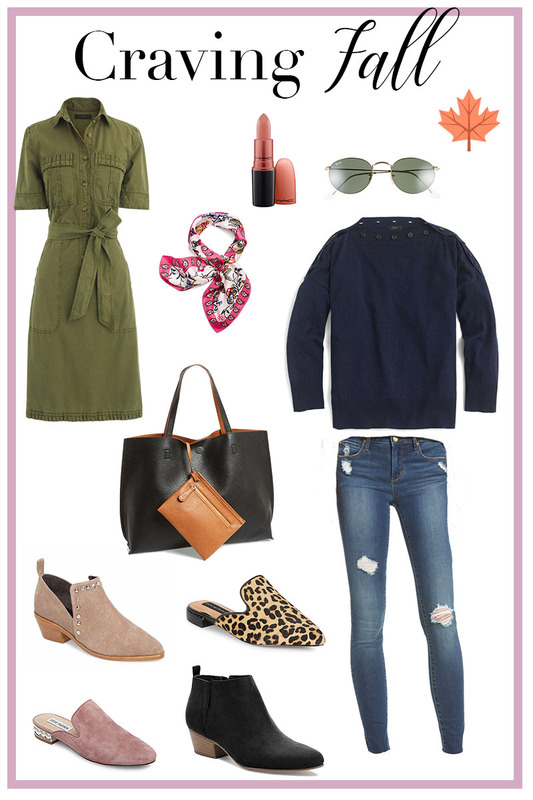 A utility dress is a great transitional piece that can be worn with mules, booties or paired with a silk scarf (I love this one and this one). Distressed skinnies are a great staple to have (these are only $64) and oversized sweaters will always be a necessary piece to add to your fall wardrobe. J.Crew has been a my go-to for good quality and affordable pieces (they have great sales)!